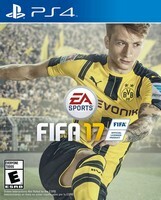 Fifa 17 is a prime example of the extreme radical liberalization of the video game industry. Fifa 17 shoves female teams in our faces, and only allows us to play a black player in The Journey. I love how these companies claim they are all about choice, and they deny us the ability to play a white character in the story mode. Or a hispanic, or asian character for that matter. Why can’t we select who we want to be? Why shove one thing down our throats? Why are denied choice of how our character will look? I am sure some will jump to the conclusion that EA Sports is racist. Fifa 17 took forever to install. Why can’t we just play this soccer game from the disc? Another choice we are being denied. I turned off the gross music in Fifa 17. Thankfully it can all be turned off in one place. The announcers are okay in Fifa 17. This game has a very European flavor to it. In fact there was little in Fifa 17 that appealed to me as an American. There are American teams for the few Americans that pay attention to soccer. I wish Fifa 17 was a more accurate representation of the sport. The passing has been broken, and the ball control is too loose. I will try to get a review set up for Fifa 17 in issue #112 of the fantastic Family Friendly Gaming e-magazine.